Kuheli Bengali Movie Review 2016. Kuheli Released on 4th November. Watch Kuheli and give your feedback.Kuheli 2016 is directed by Debarati Gupta. Bid goodbye to Vampire flicks, Kuheli is here to draw your blood – not literally, of course but metaphorically and that’s just the beginning. 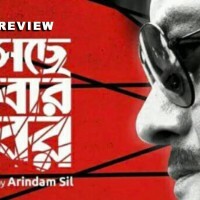 A few years back I used to be a journalist who reviewed mostly Bengali films. In the intervening gap, nothing much has changed and Tollywood continues to surprise with D-grade films that leave us film buffs embarrassed. Sayak Mallik (Indrashish Roy) and his wife Amrita (newcomer Pujarini Ghosh) are back from Europe to set up home in Kolkata. Sayak calls himself a blogger. His wife Amrita suffers from porphyria which makes her extremely sensitive to sunlight. She also suffers from selective memory loss. So he keeps her locked away in the house. Sayak goes out at night as he is apparently doing a story on Kolkata nightlife. However, there is something fishy going on. There is a serial killer on the prowl who kills a taxi driver and drains his blood out. At the point of interval it is already revealed that Sayak is the murderer. Why he kills people is the great big mystery. Trust me, you will not be interested to solve this case. But there is ACP Mahapatra played by Kaushik Sen who is flummoxed by the happenings and has to visit his senior police officer played by Barun Chanda who narrates tales of occult rituals and vampire cult. This entire episode in the film is put to convince the audience – who, as some filmmakers imagine, are totally dumb and are therefore taken for granted – that vampires and their followers exist as “Google will show.” Really? As an excuse a Tarot card reader played by Chandrayee Ghosh has also been stuffed into the film. The premise of the story is preposterous and its execution is preposterous. Amrita is born and brought up in London but speaks in chaste Bengali without any accent. Sayak has studied parapsychology abroad and they have lived in Lisbon and Helsinki. However, they choose to live in a middle class neighbourhood. Their appearances do not reflect their background at all. Raised in London, Amrita is frightened seeing a black cat. Amrita cannot tolerate sunlight and yet there is no shade in the bedroom to protect her from sun rays. Sayak puts up a blind but then how come neighbourhood boys peep inside their bedroom from the opposite building? Kaushik Sen keeps on wearing his sunglasses even at night in his own study room investigating the case with his fellow colleague. When Barun Chanda places a cup of coffee on the table for Kaushik Sen there is no smoke coming up from it. The most hilarious part is that when Sayak was in Helsinki and Lisbon there were similar murders there too – and Mahapatra immediately gets all the facts, sees a “pattern” and concludes that Sayak is the killer. 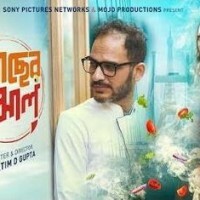 Bengali films go international! The film lacks a coherent and sensible plot. While the audience in the hall laughed and cracked jokes, the film dragged on its own without a single element of engagement. None of the actors bring any kind of credibility or substance to the story. Indrashish makes no impression although he has performed far better in earlier movies. Pujarini is a newcomer but hopefully we will get to see an improved actress in her. Kaushik Sen and Barun Chanda cannot shoulder a film like this – the film does not do justice to them. Chandrayee Ghosh is a complete waste too. Director Debarati Gupta has unnerved us. A few kissing scenes, tarot card reader, reference to black magic and Tantra and black cat does not make a thriller. Forget about mystery – Kuheli is as dead as a corpse. The review is correct and its well written.